Matt Welner, Blue Ridge Tile and Stone, LLC in Hickory, N.C., is CTI #1276.Welner is a NTCA member and State Ambassador. Matt Welner, owner of Blue Ridge Tile and Stone in Hickory, N.C., and NTCA State Ambassador for North Carolina, started mixing thinset when he was only 15. And six years ago, he struck out to establish his tilesetting business. 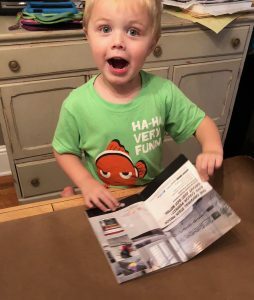 Welner’s 3-year old son Jaxson, is VERY excited about the latest issue of TileLetter! In 2019, Welner plans to take his certifications to the next level by taking the Advanced Certifications for Tile Installer (ACT) exams. 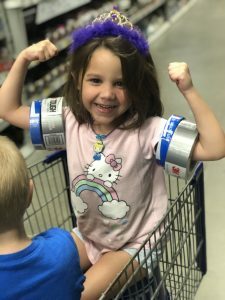 five-year old daughter, is flexing her muscles in regal style. Jaxson’s ready to take over the business. The Ceramic Tile Education Foundation (CTEF) which provides education and installer certification for professionals working in the ceramic tile and stone industry proudly announces that it has achieved a new milestone for the Certified Tile Installer (CTI) program with the certification of CTI #1500. Established in 2008 to create a pool of recognized high-quality tile installers and combat poor installation, and with strong support from leaders of the National Tile Contractors Association (NTCA), Tile Council of North America (TCNA), and the entire tile industry, the CTI program reached 1000 certified installers in 2014. Reaching 1500 certified installers in October 2018 means that reaching 2000 CTIs by the end of 2019 is achievable as the program’s momentum grows. 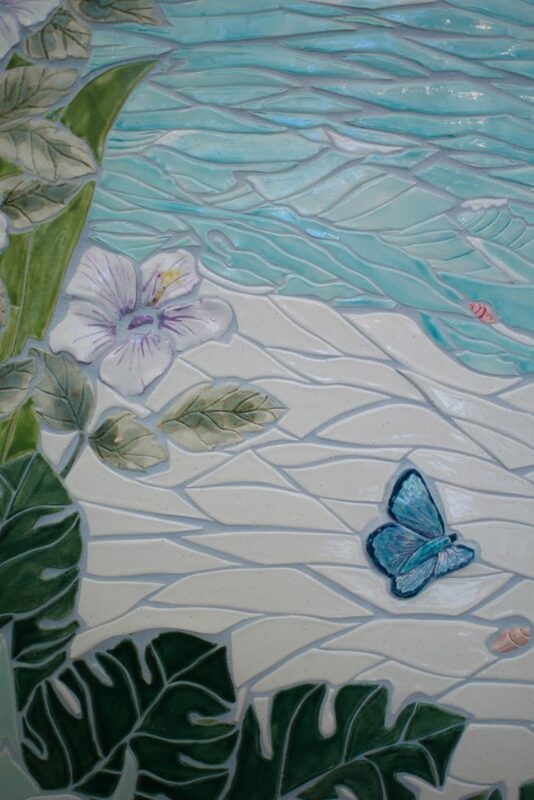 Alex Smith has been involved in custom tile installation since 2005. Based in the mountains of North Carolina, he began working in the industry under the guidance of John Buford of the Stone Cavern. He went on to form Installations by Alex and specializes in luxury residential homes. He does a significant amount of work for Bill Dacchille of Dacchille Construction, as well as other contractors and homeowners. A lifelong artist, Alex was initially trained in concert dance and is currently the board president for Dance Project Inc., a statewide arts organization. 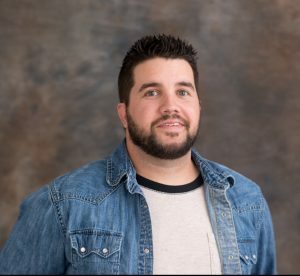 “I am honored to be a Ceramic Tile Education Foundation Certified Tile Installer,” says Alex. Why Become a Certified Tile Installer? Certified Tile Installers detail many benefits to becoming CTIs, ranging from achieving a competitive edge and bragging rights, to improving the tile industry, keeping up with tile industry education and current installation information, to avoiding failures and validating one’s skills as an installer. The Ceramic Tile Education Foundation offers the only tile industry recognized certification test validating the skills and knowledge of the installer. This industry certification will become even more important as consumers, homebuilders, general contractors, specifiers and designers seek qualifications through programs such as industry certification. The Ceramic Tile Education Foundation (CTEF) which sponsors the CTI program is supported by all segments of the ceramic tile industry. CTEF is headquartered in Pendleton, South Carolina, near Clemson University and the offices of the Tile Council of North America (TCNA). To learn more about the Certified Tile Installer program, visit https://www.ceramictilefoundation.org/certified-tile-installer-cti-program. The Ceramic Tile Education Foundation (CTEF) provides training education and installer certification for professionals working in the ceramic tile and stone industry. Certification programs include the CTEF Certified Tile Installer (CTI) program which is the only third-party assessment of installer skill and knowledge recognized by the tile industry, and the Advanced Certifications for Tile Installers (ACT). For more information, visit https://www.ceramictilefoundation.org. Once the design is created, Greenberg lays the tiles out in place, face-mounts them with plastic, cuts them into sections, and numbers them. Two challenging hand-made mosaic designs by Portland’s Ruth Frances Greenberg (rfgtile.com) have recently been installed in a Portland residence by Hawthorne Tile. The precision of the design and process of installation initially challenged Hawthorne Tile when the tile contractor set Greenberg’s mermaid mosaic in the bottom of a pool in summer 2017. 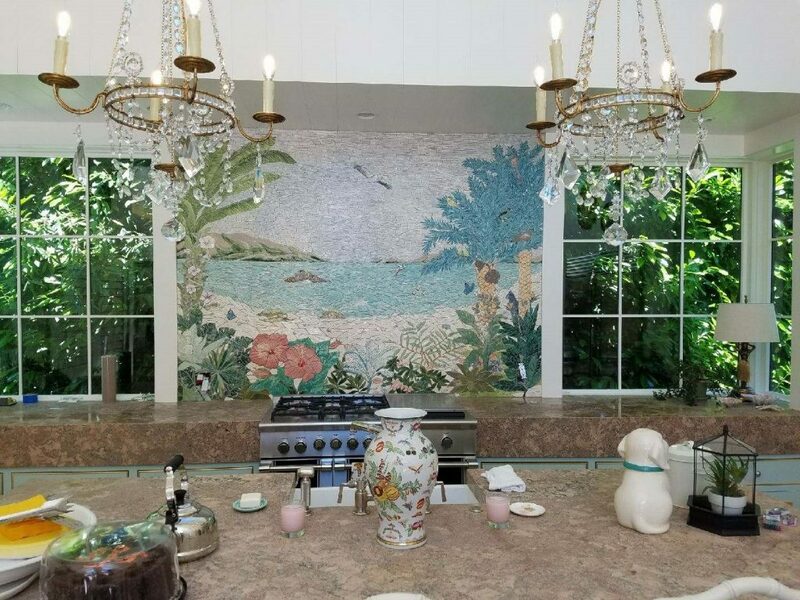 But once the owner saw the beauty of the expertly installed pool mermaid, she immediately commissioned a Ruth Frances Greenberg backsplash for the pool house kitchen. 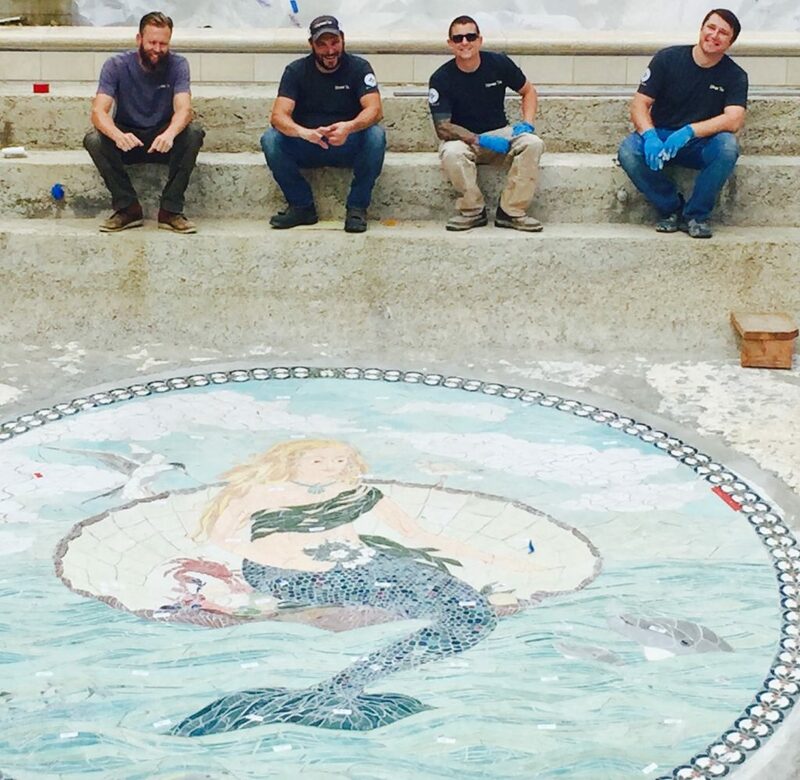 The 14´ diameter mermaid project involved “pretty intense logistics,” said Travis Schreffler, project manager for the install. 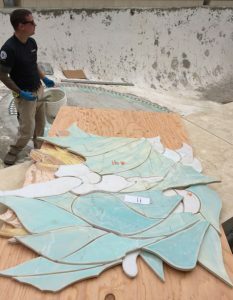 He explained that after the tiles are made by hand, fired and then re-fired for exterior use and the design is created, Greenberg lays the tiles out in a huge circle and face-mounts them with plastic, cuts them into sections and numbers them. They are then placed on pieces of cardboard to deliver them to the jobsite. The crew, with Schreffler, three Certified Tile Installers and two apprentices, started early in the day while it was cool to keep the ARDEX X77 thinset viable. Compounding the difficulty was the slope of the pool – it sloped from the shallow to deep end on a radiused arc rather than on a straight plane. That required Schreffler to build a map to clarify where the design was going – it had to be laid out and put back together like a puzzle. Compounding the difficulty was the slope of the pool – it sloped from the shallow to deep end on a radiused arc rather than on a straight plane, so it was a perfectly flat curved arc: an intersecting plane that was flat in one direction and arched in the other. The team assembled the pieces in one four-hour session to be sure all the pieces fit perfectly. 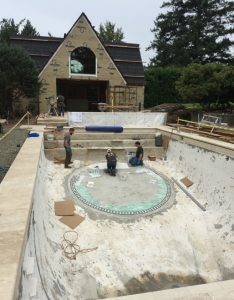 The bottom of the pool needed to be prepped first with ARDEX AM100 rendering mortar with a radius established based on the arc; then an installer and an apprentice created a series of screeds that followed the pool’s arc. The installation prep took two and a half days. 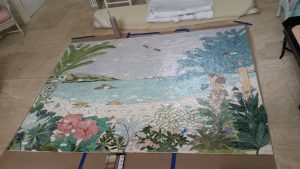 Each piece of the mosaic puzzle had to be moved down to the swimming pool, and the relationship between the pieces appraised since, as Schreffler said, “each piece relates to the other pieces in that they are loosely mounted, and needs the next piece to be adjusted, like a gear.” This meant that once the installation began, it had to be done in one four-hour take. The crew, with Schreffler, two other Certified Tile Installers and two apprentices, started early in the day while it was cool to keep the ARDEX X77 thinset viable. ARDEX’s William White was onsite to help with the logistics, providing extremely attentive support, said Schreffler. There were some nail-biter moments during the install. “Every piece you put down, you felt like it wasn’t going to fit,” Schreffler said, so at times he also jumped in to lend a hand. In the end, the job was done by noon, and left to sit protected overnight. The next day, the plastic was removed, loose tiles reattached, and it was cleaned. Two days after the install, it was grouted with ARDEX FL and was ready for the plasterers to come in and finish up with pool plaster. 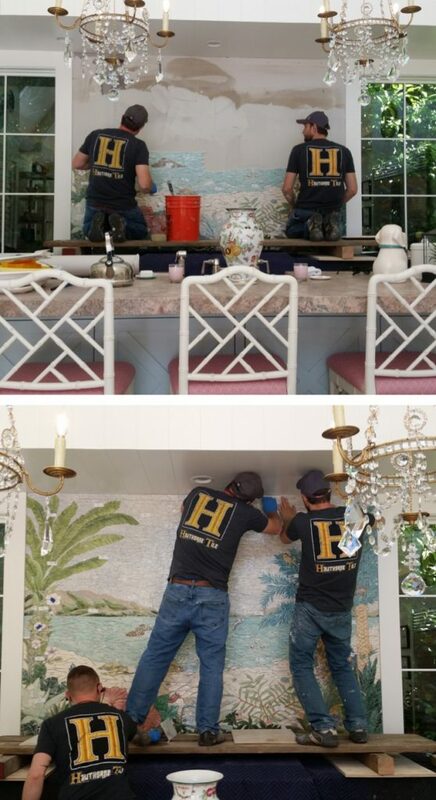 The Hawthorne Tile crew admires their work – a job well done: (L to R) Sean Carline; Travis Schreffler; Bo Carney; and Yakov Blashchishchin. 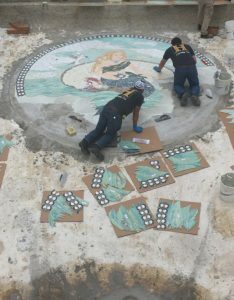 Like the pool project, the mosaics for the backsplash were assembled and numbered. The mural for this backsplash was a 6´ x 8´ Hawaiian beach scene with breaching humpback whales, sea turtles and tree frogs, again created by Ruth Frances Greenberg. Plus the homeowner had befriended stray cats while in Hawaii, so the mural included them as well. The process of assembling all the parts and pieces was the same as with the pool, but Hawthorne Tile was now familiar with this system. Installing the mosaic mural are (L to R) Bo Carney, Vladmir Blashchishchin and Yakov Blashchishchin. Mural detail. 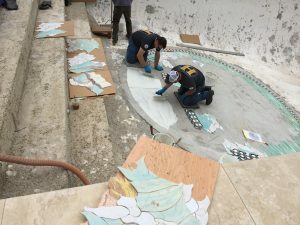 After the CTI-certified install team won the artist’s confidence with the pool install, she gave them some creative license to place flowers and some other pieces at their discretion. in the day while it was cool to keep the ARDEX X77 thinset viable. 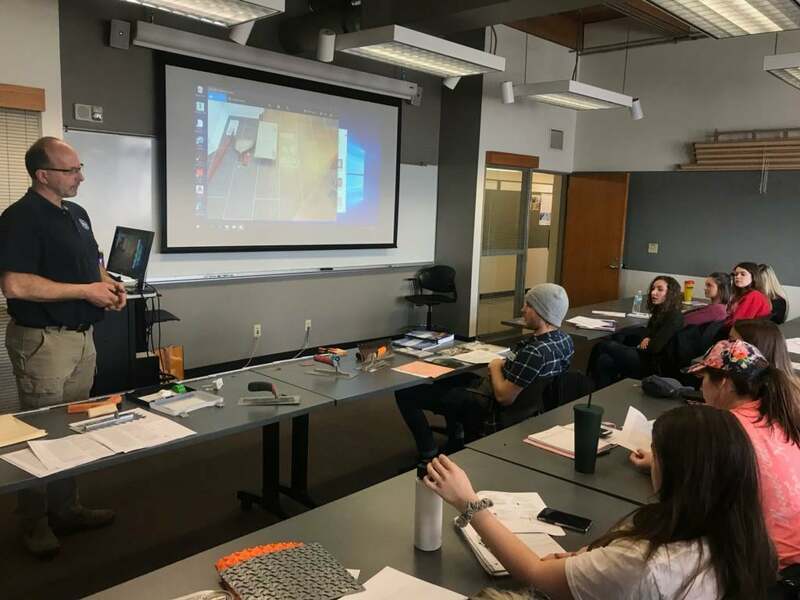 In March, NTCA State Ambassador Dan Hecox of Hecox Construction, Inc. of York, Neb., gave a class on how to avoid tile failures to 28 second-year interior design students at the University of Nebraska – Lincoln. Spale believes that it’s a vital skill for interior designers to learn to collaborate with trade contractors. “Early in my career, I drew casework sections the way I’d been taught and never really thought much about it,” she explained. 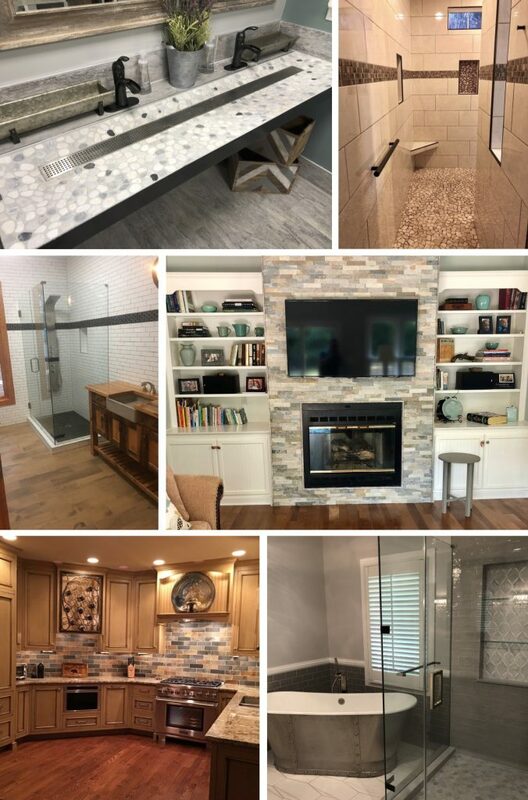 “Then I spent some time learning about custom casework and realized that had I called a fabricator before I drew my custom projects, I could have saved time, money, materials, etc. Hecox adapted the “Tile Failures – Could it Be Me?” presentation normally given by the NTCA and CTEF workshop presenters to the needs of the design students, which was a challenge in itself. Dan gave them real-world useful information to use once they graduate. “I really tried to explain to them as designers, that they can spec certain things – like qualified labor, Certified Installers, and material that falls within ANSI specs,” he said. 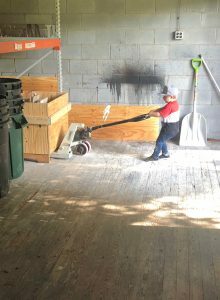 “They should know the work schedules and when things like floor prep will take place and when tile setting will start – and they should be there on the job site to inspect the floor prep and tile install.” Hecox emphasized that they should also ask questions of those involved about what they are doing. Based on the responses from the students, the class was a smashing success. Lindsay Meyer enjoyed learning from Hecox’s experience and considers it “easiest for us to understand what not to do (and why) by seeing bad examples. Dan did a great job sharing with us, and I learned a lot from him.” These insights include learning about different types of underlayment and backer board, being able to touch the samples to better illustrate the lessons, and ensuring that both GC and tile contractor are reliable, often by working with certified tile setters. 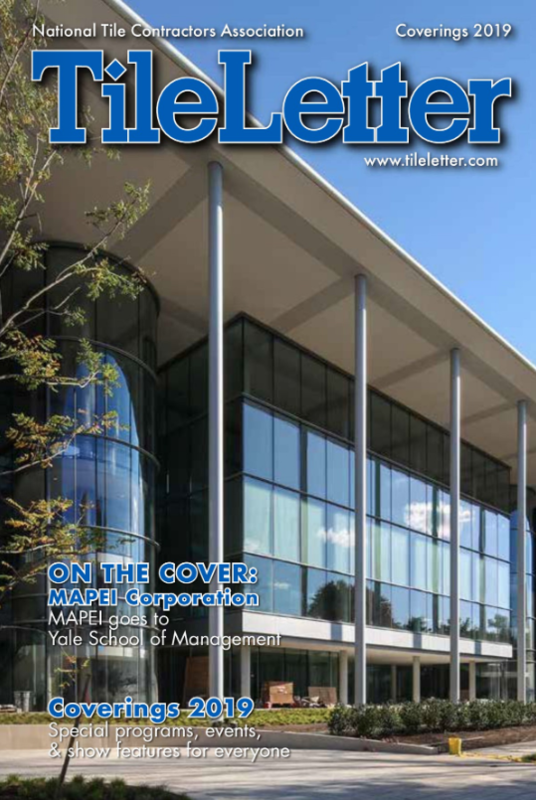 It seems from the comments of the students that Spale’s goal that the presentation “allow the students to develop a critical eye and insist that all installations are up to the standards specified,” was achieved. Might there be an opportunity to share your knowledge with a university or high school class in your area? But it all started when he joined NTCA in 2016. 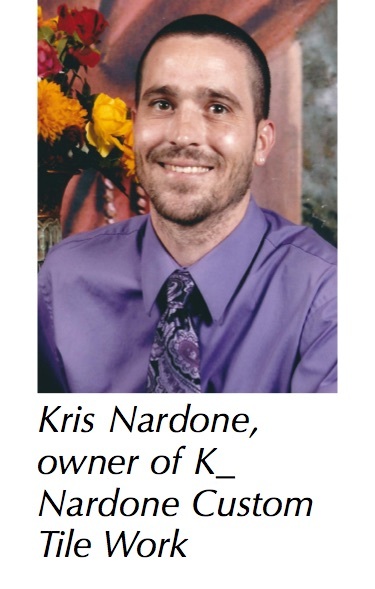 “The NTCA gave me a network of people and information that I didn’t have before,” Nardone said. 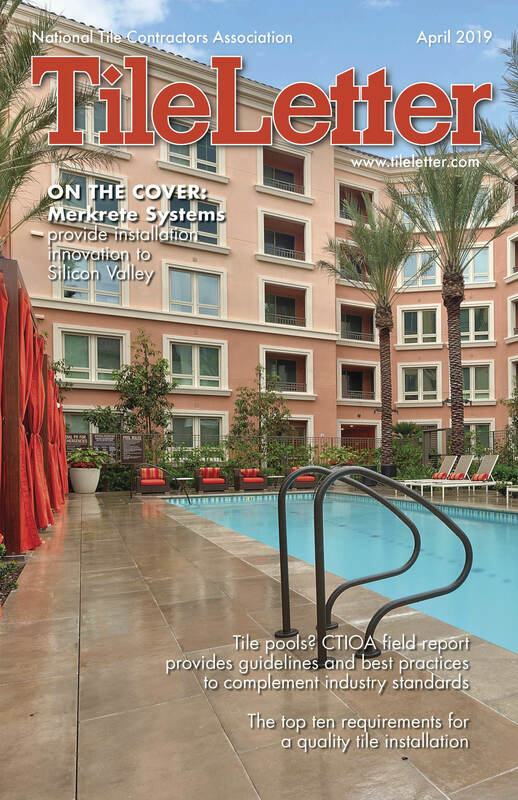 “I spoke to another Certified Tile Installer about the CTI exam. I had attended a NTCA workshop in 2017 and met a local CTI exam instructor who also spoke to me about the CTI exam. The time management aspect of the job varied significantly from the typical time management employed on a job. For instance, Nardone said, that on a typical job, he estimates “the time to complete the job and [I] push myself to complete the job in a timely manner, but I am always trying to do the best job possible for the homeowner no matter what it takes. Sark Tile, based in Lincoln, Neb., hosted NTCA Tile & Stone Workshop in October 2017. This is a groundbreaking event, since it’s the first NTCA Workshop ever hosted in Lincoln. But perhaps it should come as no surprise. Sark Tile has been committed to educating the tile industry in its area for over 20 years. Since Mark Becher founded Sark Tile in 1999, he has been working to educate his clients. 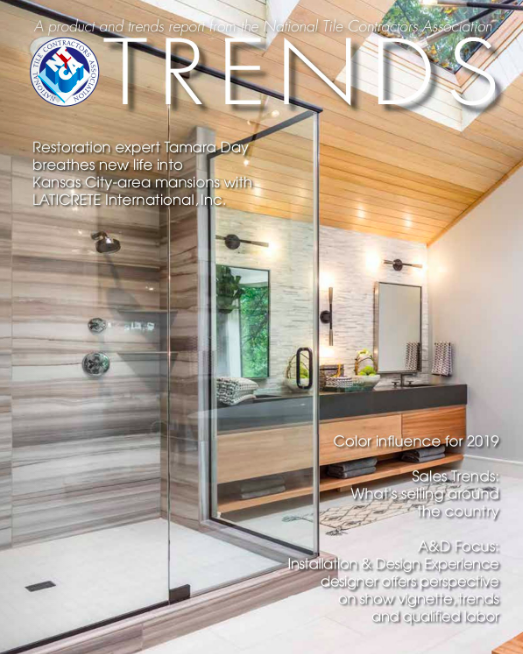 As a national distributor of tile and tile installation products, Sark Tile serves a range of clients from architects to the end consumer, offering an exceptional platform to reach a broad range of people within the industry. Sark Tile took advantage of this platform by hosting the October Workshop, and subsequently, a Certified Tile Installer (CTI) test the next month. The October NTCA Workshop titled, “Failures, Could it be Me?” was a great opportunity to bring in an expert, NTCA Training Director Mike Heinlein, to show local installers, designers, and clients how to avoid common installation mistakes. The event was described as eye opening and a brilliant refresher, even for a seasoned installer. For those who weren’t as well versed with the tile installation process, it was a first-rate opportunity to learn the correct way to perform basic techniques. Sark Tile staff (l. to r.): Katie Danehey, Serina Buchanan, NTCA’s Mark Heinlein, Mark Becher, Brian Glory, John Cury and Faith Allen Peck. After a quick break for some networking and delicious food, Heinlein finished the workshop with some hands-on demonstrations. This portion of the workshop was an excellent chance to physically show attendees why it is so important to do things correctly, and what the outcome can be if they aren’t. Attendees walked away with many tricks of the trade. The layout of Sark Tile was ideal for this presentation, with a beautiful showroom for the discussion and a spacious working area in the warehouse for the hands-on demonstration. Sark Tile’s warehouse was also an outstanding location for the CTI event they hosted in November. With the help of CTI Regional Evaluator, Dan Hecox, local installers were able to test their skills. Sark Tile hosted the first CTI test in Lincoln, Neb. in November. Kate Danehey, office manager from Sark Tile, expressed the company philosophy that the health of the industry relies on installers. Sark Tile owner Mark Becher is committed to education and bringing workshops, like this one from NTCA to the local tile trade in Lincoln. Sark Tile also hosted Lincoln’s first NTCA workshop in October 2017. A group of Sark employees ready for the CTI test to be held at the company warehouse, with (from right) Scott Carothers, CTEF; Dan Hecox, NTCA Nebraska State Ambassador and Mark Becher, Sark Tile owner. Qualified labor was prominent at Cersaie 2017, the Italian ceramic tile industry’s 35th annual show in Bologna, Italy, held at the end of September. Even before attendees could enter the vast corridors of new tile products, they were lured into “Tiling Town,” a conference hall dedicated solely to the installers who bring the industry’s products to life. Here, the Italian labor association Assoposa exhibited the knowledge and skill required in successful installations as they demonstrated work with new products, tools and methods. Tiling Town at Cersaie is dedicated solely to installation. Symbolizing the industry’s vast offerings, technological advancements and improved installation methods – as well as the origins of tile – a massive globe structure featuring quadrant impressions of earth, water, air and fire coalesced in the center of Tiling Town. Here, jagged surfaces of thin tile, flexible strips of oly-tile (a resin-based mosaic tile, custom-made for each project), and row upon row of shimmering mosaics made it clear that this was the work of artisans. Onlookers were captivated as they watched the installations. Presentation booths in Tiling Town featured expert talks on installation methods, illustrations of good versus poor installations, and clever demonstrations that showed the effectiveness of new products. Assoposa tile “fixers” (setters) demonstrate large panel mortar application. The Italian tile industry is supporting qualified labor more than ever, explaining that all sectors of the industry must understand the important role of proper installation. 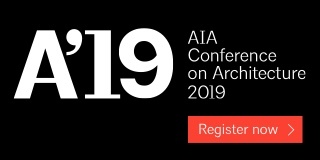 “While we focus heavily on educating installers, we also work to inform architects, dealers, construction firms and the public on installation’s critical role,” explained Francesco Bergomi, Assoposa’s Director. “Qualified installers are foundational to the overall success of our industry because their work often determines if the end user is happy with the product,” he said. Assoposa, the Federation of European Tile Fixers and the NTCA are partnering to strengthen education and awareness about the need for certified installer artisans. formations to emulate wind. 3. Thin porcelain applied to backer board creates a dramatic “rock” formation. 4. Flexible strips of “poly-tile,” a resin-based mosaic tile, custom-made for each project – is trimmed to illustrate water’s role in tile production. 5. Tile fixer (setter) installing the glass mosaic wrap for the massive globe structure. Several workshops focused on large panel tool use. NTCA President Martin Howard examines thick tiles on display. NTCA Board Chairman James Woelfel tests for lippage at Tiling Town. A designer visiting Tiling Town examines the installation process. Mike Sima, owner of Midtown Tile in Omaha, Neb., received some hometown advice early on in his career that has stuck with him through the last decade. “Never present anything to your customer that you wouldn’t present to your mother,” Sima said. This advice has served him well over the years. In fact, Sima credits it for his success as a one-man operation that specializes in residential remodeling and new construction. Moreover, Sima believes in educating oneself to be prepared for any situation on a job site. This is where becoming a Certified Tile Installer (CTI) comes in. Certification, presented by the Ceramic Tile Education Foundation (CTEF) provides the opportunity for tile installers to prove their skill and knowledge of tile installation. Becoming a CTI increases one’s level of professionalism and allows those certified to offer their clients further proof of their dedication and expertise in the field. “I wanted to test myself and my abilities,” Sima said, when asked why he became certified. “I also use [certification] as a marketing and educational tool. I try to educate every customer about certification and why it is important.” Certification and education in general has also increased Sima’s bottom line. “I find that the knowledge I have learned, the fact that I am certified, and naturally being a people person has helped me gain the trust of clients,” Sima said. Sima, a member of the Facebook group TileGeeks, found out about certification from his fellow TileGeeks. This highlights the importance of being involved with the industry. So why should others become certified? “I would tell them to test themselves,” Sima said. “Get in there and push yourself. It is rewarding. It is a marketing tool. It is a brotherhood.” Sima now uses the NTCA and CTEF logos in his correspondence, and will soon be adding them to his business cards and other promotional material. The Tile Shop, Rubi Tools team up for CTI tests in Lombard, Ill. In seven years, the number of Certified Tile Installers has grown from zero to over 1,308. 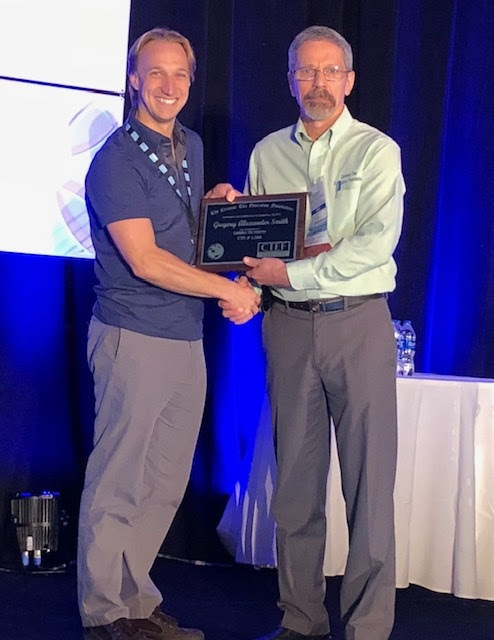 With the establishment of Kevin Insalato as the Regional Evaluator coordinator and a team of 16 Regional Evaluators, the potential to certify many quality installers and elevate the quality of tilework around the country is growing. Industry sponsors have kept the program going, providing locations for testing, materials, and catered meals and snacks for CTI candidates. Back in March, The Tile Shop and Rubi Tools teamed up for one of many Certified Tile Installation (CTI) tests at The Tile Shop in Lombard, Ill. Both companies are providing some great benefits to all CTI candidates. When you register with the Ceramic Tile Education Foundation (CTEF) to take the CTI test and request to take the test at a Tile Shop location, registration will only cost $200. Once the CTI candidate passes the written test, the hands-on test will be scheduled at a Tile Shop location; if that is successfully passed, The Tile Shop will pay the balance of the CTI test registration. The program is available nationwide. Rubi Tools is also providing a bonus to all CTI candidates. Along with a trowel and spacers, Rubi will provide its new Rubi rubber bucket, which is designed to allow installers to hammer out dried mortar or grout without damaging the bucket. The bucket should not only save time, but money as well. In addition to the tool kit, Rubi will also be offering a $50.00 coupon as part of the CTI vouchers provided to every CTI candidate who successfully passes the test. The CTI test in March was a success thanks to the Tile Shop regional sales manager, Dacy Corlee, and Rafael Rodriguez of Rubi Tools. The CTI candidates at this event were Nicholas Roth from All about Tile in Adrian, Mich., John Martin from John Martin Tile in Decatur, Ill., Greg Twarog from Surfaces 15 in Downers Grove, Ill., Omar Delacruz from Omar’s Custom Flooring in Chicago, Ill., Jamiel Sabir from California Flooring in Manteno, Ill., and Joe Voss from Voss Home in Frankfort, Ill.
For more information about taking the Certified Tile Installer exam, visit www.ceramictilefoundation.org/tile-certification-overview-ctef. (l to r) Nicholas Roth, The Tile Shop regional salesmanager; Dacy Corlee, John Martin, Greg Twarog, Omar Delacruz, Jamiel Sabir, Joe Voss, and Regional Evaluator Rafael Lopez. Rubi Tools provides a bonus to all CTI candidates. Along with a trowel and spacers, Rubi provides its new Rubi rubber bucket, which is designed to allow installers to hammer out dried mortar or grout without damaging the bucket, and a $50 coupon as part of the CTI vouchers for those who successfully pass the CTI exam.